The world's most famous two-mover? I almost got the top board pairing of the Isle of Man tournament correct, although it was Kramnik v Caruana on Board 2, rather than Carlsen v Kramnik on Board 1. However it looks as though the randomised pairing experiment isn't that bad, with the mix of 'interesting' pairings providing a change from the usual top half v bottom half massacre of most large swisses. What will be interesting of course is the ripple effect of the first round pairings throughout the rest of the tournament. Along with the IOM event, I'm also up late to watch the World Cup Final between Lev Aronian and Liren Ding. At the time of posting 30 moves have been played, and the position is pretty equal. Unlike the cut throat nature of swiss events, I expect this match will be a little more sedate, with both players happy to avoid risks, hoping their opponent goes astray instead. Having tipped a MVL v So Final in the 2017 World Cup, I've woken up to the news that neither of those players have qualified. It will be an Aronian v Liren Ding final instead, after both of those players won their rapidplay playoffs. Maxime Vachier-Lagrave looked to have one foot through the qualifying door after beating Aronian in their first playoff game, but a gutsy piece sacrifice in the next game paid off for Aronian, and he evened the score. Four more draws meant the match went to 'Armageddon' where Aronian managed to win the Q v R ending. So and Ding only saw one decisive game, but this was enough for Ding to go through to the final. So had one final chance to pull level, but in the final rapidplay game, Ding was happy to hold the position (rather than push for more), and the game finished in a draw. By scoring 7/9 (finishing equal first) in the Anogia GM tournament, 16 year old Anton Smirnov has scored his third GM norm, which is enough for him to earn the GM title. Canberra born Smirnov needed to win his last round game against FM Antoine Favarel (FRA) and for a lot of the game it looked very touch and go. Smirnov decided to launch a kingside attack, and while trying to defend Favarel misplayed the position (36. ... Rd3??) allowing Smirnov to secure the point, and the title. Smirnov now becomes Australia's 7th Grandmaster, and the third in recent years. Already a mainstay of the Australian Olympiad team, he may even be challenging for the number 1 spot in Australia;s 2018 team, which may be an all GM outfit for the first time in history. The Isle of Man tournament has really taken off in the last decade, and is now challenging events like Gibraltar and the Iceland Open for the title of 'Best Open' in the world. This years event starts on Saturday, and has boosted it's prestige even further, with the news that World Champion Magnus Carlsen is taking part. In fact the tournament field contains 4 World Champion's, or 5 if you count Ilyumzhinov's bonkers scheme to declare Shirov as a former World Champion. The top 14 seeds are rated above 2700, and its GM's all the way down to seed 59. The only Australian player in the field is IM John Paul Wallace, although I did note Bill Egan's name in the minor, but it his is English namesake, rather than the Canberra resident. The tournament begins on Saturday 23rd September, and is a 9 round swiss. Apparently the pairings for the first round are totally random, so it might be worth tuning in to the first round, just to see a surprisingly early Carlsen v Kramnik match up! This Deadspin article about the ranking of board games is too good to pass up. Not so much the article actually, but the totally Not Safe For Work comments that follow it. You have been warned. John Winkelman (previously featured in this blog here), returned from a recent trip to the United States bearing gifts. They were a number of tournament brochures from various large US chess opens, which he thought might be of interest to me. They of course were, not because I planned to enter any of them, but as an insight into how events in the US are structured. Free entries for GM's and IM's have an equivalent amount deducted from any prizes won. The tournament information was generally printed on thick card (rather than the fancier brochures we use in Australia) which to me seems easier to distribute. Some of the ideas might be useful in Australia (eg the use of online ratings to seed unrateds), but I can't see the whole "bring your own set" idea catching on. The 2017 World Cup schedule is pretty tough, especially if your'e one of the players who keeps going to tie-breaks. So far there hasn't been a scheduled rest day, meaning that a win in regulation is the only way you can get a day off. Tonight sees the start of the quarter finales, is as good a time as any to try and predict a winner. Firstly, with all the previous upsets, the reaming top half is a little stronger than the bottom half, and that is where I think the eventual winner will come from. As I write this, Aronian has already defeated Ivanchuk in that bracket, although he was going to be one of my picks anyway. The other pairing in that half is Vachier-Legrave against Svidler, and while Svidler has the experience of getting to this stage in 5 World Cups, I think MVL will win, and go on to play Aronian. In the bottom half I think So and Liren Ding will progress, with So winning the semi-final. But I think the eventual winner will come from the top half, with MVL just shading Aronian, and then going on to beat So in the final! Here is a puzzle described by Hubert Phillips as "possibly the world's most famous two-mover". An interesting claim, in part because I'm note sure anyone else has bothered to keep a list of such things. Also, as these words were written in 1932 (and the puzzle was first published in 1905), I am wondering whether more recently published puzzles could now claim that title. As with most two movers, this only has a passing resemblance to a 'real' chess position, and the composer has left plenty of false trails to catch the over confident. A number of years ago I posted this, concerning a trap in the Scotch Gambit. Tonight at the Belconnen Chess Club, I got to see what happens if both sides realise what is really going on, at least up until a point. Black avoided the sometimes played 6. ... 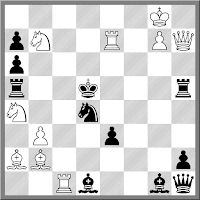 Resigns, and White knew that retreating the Bishop from h6 is also trouble. But Black failed to spot how strong White's attack was, possibly thinking that 13. ... Bf5 was enough to save the day. Of course it wasn't, and White ended up with the quickest win of the night. The 2017 Belconnen Club Championship begins tomorrow evening (Tuesday 12 September), at the Belconnen Chess Club, on Hayden Drive, University of Canberra. This is Canberra's only FIDE rated club event this year, so provides a good opportunity to either improve your international rating, or get one for the first time. The tournament runs for 7 weeks, and is playing with a slightly faster time limit of 60m+30s per move. FIDE changed the rules regarding time control for rated events, so players over 2200 are no longer excluded, but at the same time, games involving players above the 2200 mark are not rated. Magnus Carlsen started the World Cup with 4 from 4, befitting his number 1 seeding. However the first game of the third round didn't go according to plan, as he got hacked by Xiangzhi Bu from China. Carlsen played the Bishops Opening, and Bu sensibly played the Black side like a Ruy Lopez. He even went as far as playing a Marshall Gambit type sacrifice, and after Carlsen accepted, went nuts on king side. Carlsen could have taken an immediate draw after the sacrifice on h3, but decided to play for a win instead. However this blew up in his face, not so much because of his position, but that he spent so much time working out what to do. As a result, he got into severe time trouble and played a couple of second best moves. Bu gave him one chance at the end, but after Carlsen missed it, the upset was on the scoreboard. The Canberra Lifeline Bookfair is on this weekend, and if you are looking for chess books, there are plenty to be had. I got in nice and early this morning (along with a few other collectors), and I'm pretty sure this year saw the biggest chess collection I can remember. There were a number of familiar titles, but there were also a few surprises. Someone donated quite a large number of Informators, including a No. 1, which I snapped up. Curiously there were a few books on the Laws of Chess, so I grabbed those as well, as they contained snapshots of the Laws for the years they were published. Even the Board Games section had more than the usual amount of chess stuff, and I saw one shopper snap up every chess set she could fine. I found a Pavilion Talking Electronic Chess Computer for $8, adding to my growing collection of chess computers at home. When I left there were plenty of books on the table, so you should be able to get something if you drop in over the weekend. Today's Google Doodle commemorates Sir John Cornforth, who won a Nobel Prize for Chemistry in 1975. Of course in the chess community he is was also known as a strong player, competing in the 1936 Australian Championship, as well as the first Australian Correspondence Chess Championship. Today is the 100th anniversary of his birth, and he passed away in 2013. Apart from an obituary I posted at the time, there was a very good article about his chess life written by Paul Dun in a recent issue of Australian Correspondence Chess Quarterly. The Pirc/Modern is often a system that aggressive players have some difficulty with. As Black's strategy is to sit back and wait till White over reaches, White can fall into the trap of playing too cautiously. If that happens, Black has already scored a small victory, as White is out of their comfort zone. My personal preference is to take it head on, aiming for an early Bh6. Over the years there have been a number of crushing wins for White in this line, and they are worth studying. Probably the most famous was Kasparov's win over Topalov at Wijk aan Zee in 1999. Kasparov was not afraid to leave his queen out on h6, even after Topalov castled queenside, as he was busy getting his other pieces across to the queenside. 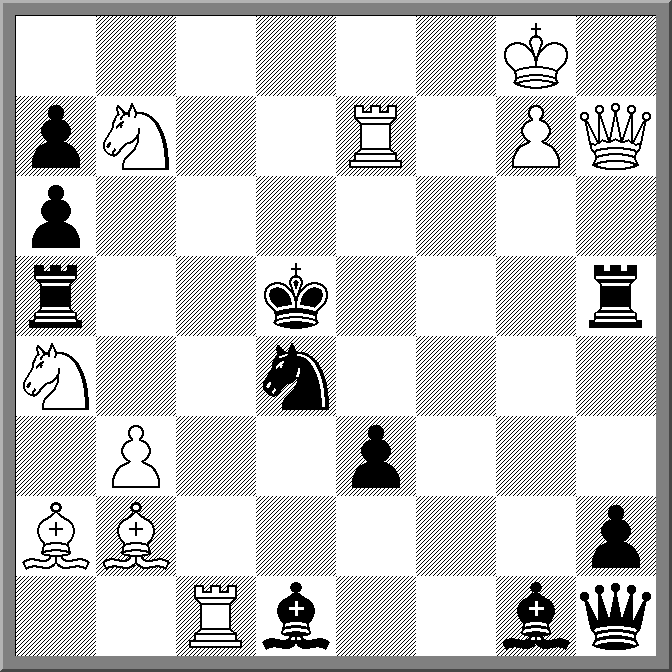 Of course Kasparov's choice of opening in itself was not winning, as he needed to find 24. Rxd4!! but he did get a position where such an attack was possible. At the time I was off to bed last night, I had chalked up a win for GM Alex Fier against higher rated GM Etienne Bacrot in the 2017 World Cup. When I awoke this morning, the win had turned into a draw. It was a lucky escape for Bacrot, and might explain why they drew so quickly in Game 2. Meanwhile Australian IM Anton Smirnov continues to impress, holding GM Sergey Karjakin to another draw, and sending the match into tie breakers. At this stage there are already a few matches that will continue tomorrow, but like Smirnov, almost all of them are via the draw-draw path. Only Vladimir Fedoseev has bounced back from losing the first game to even the match, but I am sure there will be a few more as the round goes on. Of the tournament favourites, Svider, Giri and Nakamura are already through to the second round, while Number 1 seed Magnus Carlsen is still trying to overcome bottom seed FM Oluwafemi Balogun from Nigeria. The first round of the 2017 FIDE World Cup is underway, and a few of the early results have come in. Significantly for Australia, IM Anton Smirnov has drawn his first game against GM Sergey Karjakin. The opening was a fairly sharp line of the QGD (with Bf4) but eventually simplified into a heavy piece ending that was drawn on move 30. The two players return to the board tomorrow, with Karjakin having the advantage of the white pieces. Most of the other games to finish have ended in draws, with a few highly rated players (Ivanchuk, Radjubov) taking the peaceful route. So far there has only been one real upset, with Sambuev (CAN) cracking GM Yi Wei, but Alex Fier (BRA) is looking good against Bacrot (FRA) and that may also end in a win for the lower rated player. Here are 3 puzzles to put your mind to, with 2 of them being related to chess, to some degree. N students are playing a variant of 'Duck, Duck, Goose'. In this variant, Student 1 goes around the ring of players (which now excludes Student 1), announcing Duck N-1 times, and Goose the Nth time. Student 1 then sits out while the 'Goose' repeats the process. Who is the last student to be the Goose?